Lately Ive really been trying to get healthier. Not just working out, but my whole lifestyle. Eating more fruits and veggies, drinking more water, eating non-processed foods etc. You get the picture. I’ve really given a lot of thought about going Paleo but its pretty hard, as well as unreasonable, to expect my family to make that transition also. So I’ve done what I can for now, until they decide they’re into it. More protein, fish, veggies, fruit, and water. Less bad carbs (picture me bawling) – no white bread, no white rice, minimal white potatoes, and a very minimal amount of sugar. Whats too bad about that? My wonderful fiancé got me a Ninja Blender that is out of this world! As of two weeks ago, I have started each day with a GREEN SHAKE! 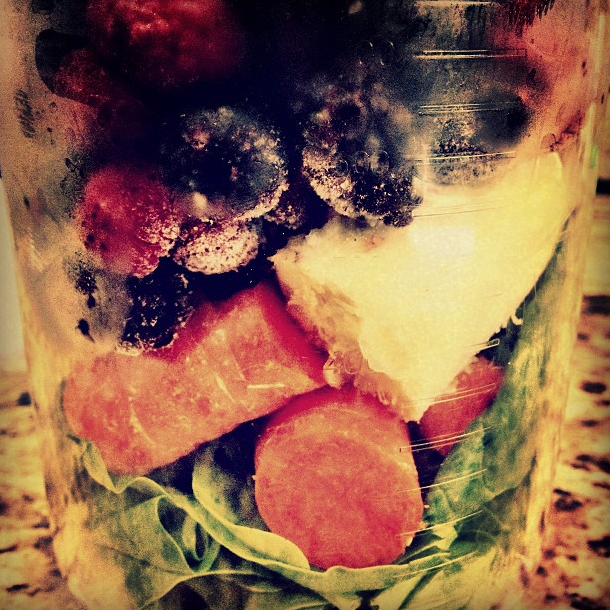 Load that baby up with everything good for you, and on gym days you can even add your protein powder to it! I personally prefer the frozen fruit because it makes it thicker and colder, it doesn’t rot like fresh fruit does, and its way more affordable. I usually get three bags of varying mixes to have a variety during the week. Blueberries, blackberries, red raspberries. Mango, pineapple, peaches. Strawberries, mangos, bananas. When you make a smoothie you need some sort of liquid. A friend of mine suggested I use warm brewed Green Tea, which is GENIUS! Not only is it wonderful for you, but it helps melt the frozen fruit. About a 1/2 cup liquid. I add it slowly until my smoothie is the consistency I want. Blend until smooth, and add to whatever glass or bottle you want! 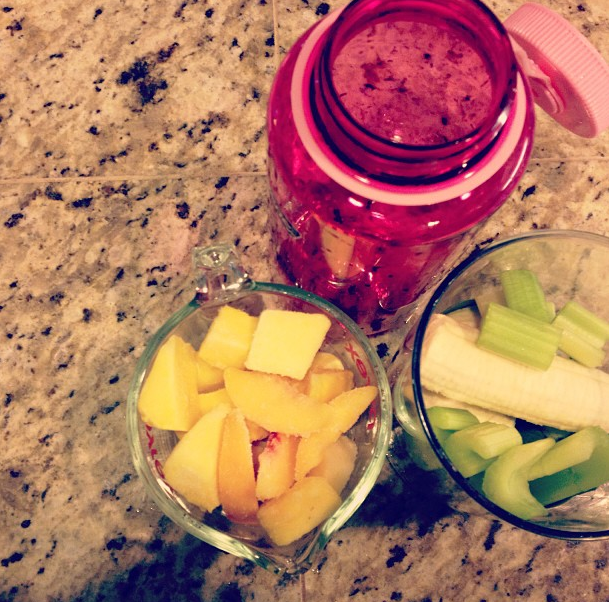 These smoothies are so very filling, and healthy! You get a huuuuge dose of veggies and fruits. I have replaced my breakfast with them, and they keep me full until about 12pm (drinking smoothie at 7am).